I'll start this with a disclaimer. I prefer to think of myself as a human being. A human that likes to cycle, be outdoors, connect with people, and experience different cultures...among other things. However, I'm also definitely a woman and I'm also cycling the Great Divide Mountain Bike Route. So I feel compelled to write this post about cycling the GDMBR "like a girl". Sure, sometimes one needs to take off some bags to get up a very steep section of trail (e.g., Wigwam), but in general, I can pickup my bike. I will be able to lift my bike, fully loaded. I will be able to navigate the route. I will know how to make a fire, setup and pack up camp. I will know how to fix most of my bike issues, and perform simple maintenance to keep it rolling. Changing a tire in Yellowstone National Park... Was a delicate operation with a generator hub, but I was able to save a lot of the Stan's and seat the bead with a hand pump. I will give every ounce of effort to pedal up a "pusher" until I can't anymore, or until it seems I'd risk injury for the long haul. I will ride as fast as I can downhill without risking crashing. I will try to improve my technique along the way. I will pay attention. I will observe others bikepacking systems (bike, gear, routines), compare it to my own, and see if I could experiment with my own system. I will learn from others and from my own experiences. I'm not afraid to admit this "pusher" got me at the top. Brazos pass, you were too much. But I gave it my best. To me, it means that I will wake up every day to a new day; one where that future is slightly uncertain. I will ride as much as I can until I'm too tired or until there's an opportune spot to camp (e.g., one with water). I will look around as I ride and try to really be in the present with the stormy clouds, rolling hills, skyscraping mountains, scrubby sage bushes, or aspen groves. I wil be open-minded and open-hearted when I roll into a town; keen to receive and reciprocate the energy given by locals and other travelers. You never know who you might meet and how you may positively impact each other. Getting to know people along the way only happens if your head is up and you're open to people. 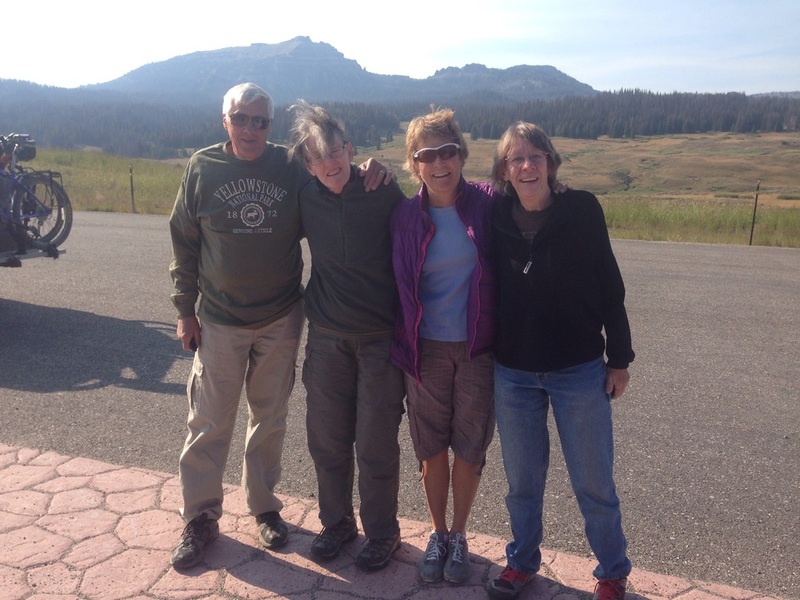 Here's Team FemmRADo with a husband, Adam, whom I would later have a glorious stay with in Salida. I am not afraid when I'm alone in my tent. I'm asleep. I am not carrying a gun, but I am carrying bear spray and a quick-release pepper spray for dogs. (I haven't used either yet.) I am not afraid to be "in the middle of nowhere", because it's not nowhere. It is most definitely somewhere. This canyon could've felt like nowhere at this all time emotional low (in certainty around water, alone, very difficult terrain), but I decided it was definitely and awesome "somewhere", and that I was lucky to experience it. I am putting forth an expectation that most people are basically good. I am being good to other people. I am giving people the time of day, a listening ear, or an explanation about myself and my bike. I am cycling the same miles as everyone else. 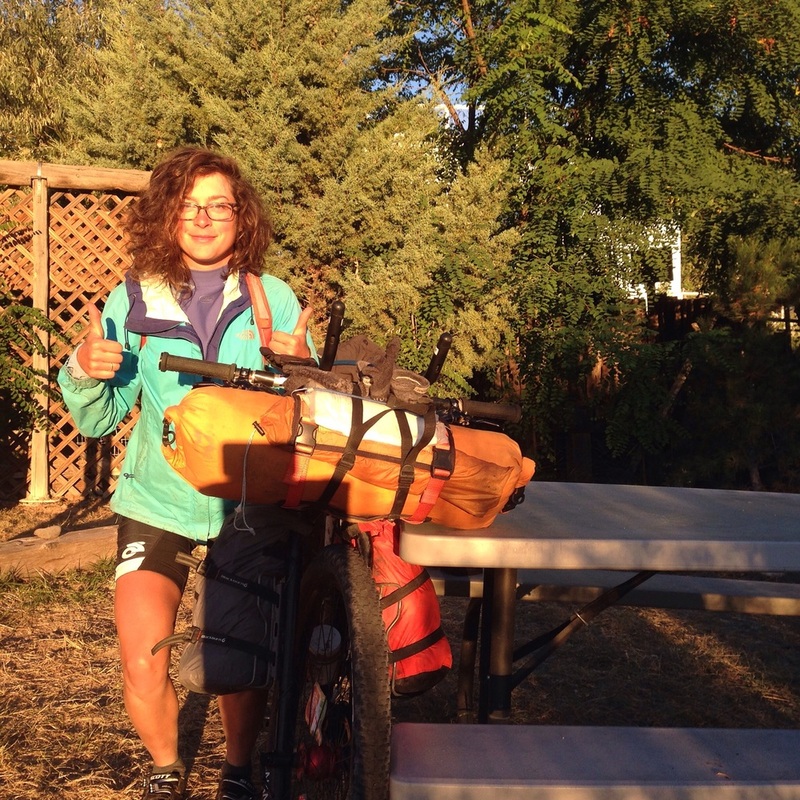 Whether you are a female or not, you can cycle the Continental Divide. You can even do it solo. There are plenty of nice people out there, and there are plenty of other people cycling the GDMBR. Chances are that you will run into some of them and enjoy company for a bit. So - my advice, as a female and as a human, is to take on the GDMBR if you think you'd like to do a whole lot of camping and cycling in scenic places without a lot of cars. If this sounds like a basic description of what it means to cycle the GDMBR, then I've described what it means to cycle the GDMBR "like a girl". Thumbs up for getting good at the morning routine and being ready to take on every new day.